The power of video will make visitors stay on your site longer, improve retention of your core message and boost your site's SEO. Video gives you a voice and personality in this crowded and time-strapped world. Recent research from Forrester Research and YouTube show only 20% of web visitors read a website, yet 80% will sit and watch the same content in a video. 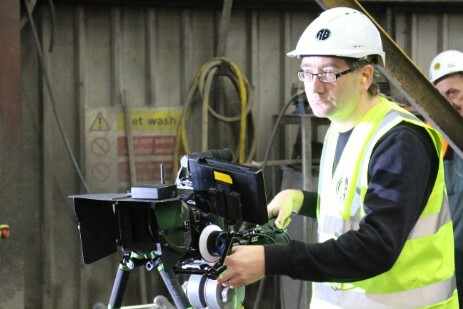 Andrew filming one of our web video productions. Nova has been producing web video since 1998, and we produced our first live streaming broadcast in 2000 - so we've got great experience in videos designed especially for the internet. We understand such videos have to be cost-effective, and we can produce a range from graphic-based explainers to live-action introductions - as well as full-featured mini documentaries. The team behind the £5 million EU-funded project to restore the moorlands around the Peak District and the North Pennines chose Nova to produce a series of 7 short video documentaries to explain why the work is so important and the complexity involved in the solutions. The results were uploaded to the projects' YouTube channel in full HD and embedded in their website. The team regularly share the links to the videos on their Facebook and Twitter accounts, generating a constant stream of views, and satisfying the requirements of the funding partners. The Nare hotel in Cornwall is one of a growing number of hotels and bed & breakfasts across the country to chose Nova to produce short introductory videos for their website. Here, the owners wanted to push The Nare's traditional old English qualities, so we produced a stylish short film to match. The video is available on the hotels' website and also on our own Hotel View TV site, which in the coming months will be launched as the first portal with videos for hotels and bed & breakfasts from across Britain and Ireland.